① I use it to make 1 and 2 cups of Royal Milk Tea on the table. The heat source is a mini gas burner. With three legs, the handle of the thermal power adjustment and the handle of the ignition will hit the legs. If it is 4 legs it will be more convenient. ② In the mini gas burner used, the tripod stand is high, so we adjust by adjusting the board below. It is convenient to be able to adjust the height. ③ The heat source is a mini gas burner, the legs become considerably hot. When using a table depot, I put a board and use a tripod on it. 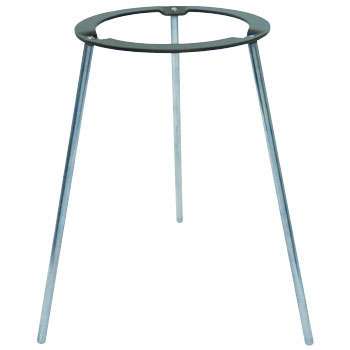 You will be able to use it without worrying about the table unless the tip of the leg gets hot. This review is about item#2922376. It is easy to use with alcohol lamp and size right. This review is about item#2922367. I use it to heat chips when smoking. I have not used the smoker yet because it is not completed yet, but it is easy to assemble and it is solid so it seems that I can use it as I expected. It can not be helped because it is cheap, but I could finish painting immediately. I do not care because there is no problem in particular. Because the legs get hot, I applied a shrink tube and took heat resistance measures. This review is about item#02922376. Although it is a completely different use, I purchased two size differences and reorganized my legs and bases and it got just good usability. The ring coating was peeled off by the third use. It gets hot enough that you can not touch the legs with your hands. However, since most of the use is outdoor such as camping, it does not matter at all. In case of being used in a living table etc., just to be sure, it would be safe to lay a hundred Yon stainless steel tray. Once it was used for about 5 minutes, the paint of the ring was peeled off. Parker treated film is exposed. Especially, I did not heat up, the equipment I used was an ordinary alcohol lamp of AS ONE, and the fuel was also absolute ethanol. Also, feet tend to get hot, and it will not touch with bare hands even in about 5 minutes.